Often Football Jumpers are printed with a logo to commemorate a teams notable achievement or celebration . A recent example would be the Anzac Day Game between Collingwood Magpies and Essendon Bombers . Both teams wore their traditional strip honouring the Anzacs with a commemorative logo printed on one side of their football jumper , jersey , guernsey. 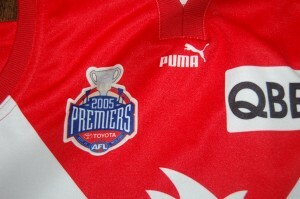 Not so recent events but still memorable are Premiership Wins eg the Sydney Swans wore a jumper with the 2005 Premiers logo printed on one side of the football jumper , jersey , guernsey . 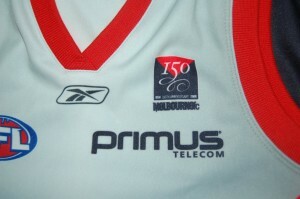 In 2008 the Melbourne Demons celebrated 150 years in the Competition with a 150th anniversary logo printed on their jumper , jersey , guernsey . All noteworthy events , and cause for celebration at the Clubs . Printed on jumpers to remember. These celebratory football jumpers, jerseys , guernseys are milestone markers in the Clubs history. Fans and collectors everywhere make them highly collectible. This entry was posted on Friday, April 30th, 2010 at 9:54 am	and is filed under AFL, football jumpers. You can follow any responses to this entry through the RSS 2.0 feed. Both comments and pings are currently closed.